For other uses, see Sphere of influence (disambiguation). 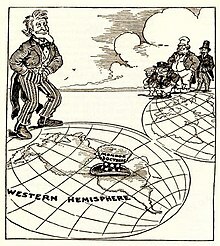 A 1912 newspaper cartoon highlighting the United States' influence in Latin America following the Monroe Doctrine. While there may be a formal alliance or other treaty obligations between the influenced and influencer, such formal arrangements are not necessary and the influence can often be more of an example of soft power. Similarly, a formal alliance does not necessarily mean that one country lies within another's sphere of influence. High levels of exclusivity have historically been associated with higher levels of conflict. In more extreme cases, a country within the "sphere of influence" of another may become a subsidiary of that state and serve in effect as a satellite state or de facto colony. The system of spheres of influence by which powerful nations intervene in the affairs of others continues to the present. It is often analyzed in terms of superpowers, great powers, and/or middle powers. Sometimes portions of a single country can fall into two distinct spheres of influence. 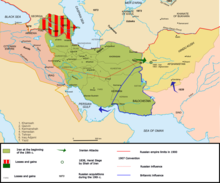 In the colonial era the buffer states of Iran and Thailand, lying between the empires of Britain/Russia and Britain/France respectively, were divided between the spheres of influence of the imperial powers. Likewise, after World War II, Germany was divided into four occupation zones, which later consolidated into West Germany and East Germany, the former a member of NATO and the latter a member of the Warsaw Pact. The term is also used to describe non-political situations, e.g., a shopping mall is said to have a sphere of influence which designates the geographical area where it dominates the retail trade. 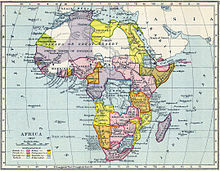 A map of colonial Africa in 1897 showing the European "sphere[s] of influence". Many areas of the world are considered to have inherited culture from a previous sphere of influence, that while perhaps today halted, continues to share the same culture. Examples include the Anglosphere, Arab World, Eurosphere, Francophonie, Françafrique, Germanosphere, Indosphere, Latin Europe/Latin America, Lusophonie, Turkosphere, Chinese cultural sphere, Slavisphere, Hispanophone, Malay World, as well as many others. An example of spheres of influence was China in the late 19th and early 20th Century, when Britain, France, Germany, and Russia (later replaced by Japan) had de facto control over large swaths of territory. These were taken by means of military attacks or threats to force Chinese authorities to sign unequal treaties and very long term "leases". In December 1897 German Kaiser Wilhelm II declared his intent to seize territory in China, precipitating the scramble to demarcate zones of influence in China. The German government acquired, in Shandong province, exclusive control over developmental loans, mining, and railway ownership, while Russia gained, in addition to the previous tax exemption for trade in Mongolia and Xinjiang, economic powers similar to Germany's over Fengtian, Jilin and Heilongjiang provinces. France gained a sphere over Yunnan, Guangxi and Guangdong provinces, Japan over Fujian province, and the British Empire over the whole Yangtze River Valley and Tibet. Only Italy's request for Zhejiang province was declined by the Chinese government. These do not include the lease and concession territories where the foreign powers had full authority. In 1902, Winston Churchill gave a speech regarding the division of China by the great powers, where he declared that "we shall have to take the Chinese in hand and regulate them", "I believe in the ultimate partition of China" and "the Aryan stock is bound to triumph". The Russian government militarily occupied their zone, imposed their law and schools, seized mining and logging privileges, settled their citizens, and even established their municipal administration on several cities, the latter without Chinese consent. The powers (and the United States) might have their own courts, post offices, commercial institutions, railroads, and gunboats in what was on paper Chinese territory. However, the foreign powers and their control in some cases could have been exaggerated; the local government persistently restricted further encroachment. The system ended after the Second World War. On September 6, 1899, U.S. Secretary of State John Hay sent notes to the major powers (France, Germany, Britain, Italy, Japan, and Russia), asking them to declare formally that they would uphold Chinese territorial and administrative integrity and would not interfere with the free use of the treaty ports within their spheres of influence in China, as the US felt threatened by other powers' much larger spheres of influence in China and worried that it might lose access to the Chinese market should the country be partitioned. Although treaties made after 1900 refer to this "Open Door Policy", competition among the various powers for special concessions within China for railroad rights, mining rights, loans, foreign trade ports, and so forth, continued unabated, with the US itself contradicting the policy by agreeing to recognise the Japanese sphere in the Lansing-Ishii Agreement. In 1910, the great powers, Britain, France, Germany, United States, and later, Russia and Japan, ignored the Open Door Policy to form a banking consortium, consisting of national banking groups backed by respective governments, through which all foreign loans to China were monopolised, granting the powers political influence over China and reducing economic competition between foreigners. This organisation controlled the majority of Chinese tax revenue in a "trust", and utilised a small portion to bolster the rule of Yuan Shikai, to great effect. The renewed consortium of UK, France, Japan and US in 1920 effectively vetoed all developmental loans to China, ruling over the Chinese government by aiming to control all rails, ports and highways in China. 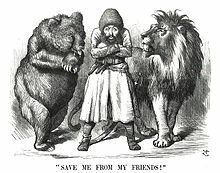 In the Anglo-Russian Convention of 1907, Britain and Russia partitioned Persia (Iran) into spheres of influence, with the Russians gaining recognition for influence over most of northern Iran, and Britain establishing a zone in the Southeast. For Siam (Thailand), Britain and France signed an agreement in 1904 whereby the British recognised a French sphere of influence to the east of the River Menam's (Chao Phraya River) basin; in turn, the French recognised British influence over the territory to the west of the Menam basin and west of the Gulf of Thailand. Both parties disclaimed any idea of annexing Siamese territory. Alexander Hamilton, first U.S. Secretary of the Treasury, aimed for the United States to establish a sphere of influence in North America. Hamilton, writing in the Federalist Papers, harboured ambitions for the U.S. to rise to world power status and gain the strength to expel European powers from the Americas, taking on the mantle of regional dominance among American nations, although most of the New World were European colonies during that period. This doctrine was formalized under President James Monroe, who asserted that the New World was to be established as a Sphere of influence, removed from European encroachment. This was termed the "Monroe Doctrine". As the U.S. emerged as a world power, few nations dared to trespass on this sphere. A notable exception occurred with the Soviet Union and the Cuban Missile Crisis. As of 2018, Secretary of State Rex Tillerson continued to refer to the Monroe doctrine to tout the United States as the region's preferred trade partner over other nations such as China. For another example, during the height of its existence in World War II, the Japanese Empire had quite a large sphere of influence. The Japanese government directly governed events in Korea, Vietnam, Taiwan, and parts of Mainland China. The "Greater East Asia Co-Prosperity Sphere" could thus be quite easily drawn on a map of the Pacific Ocean as a large "bubble" surrounding the islands of Japan and the Asian and Pacific nations it controlled. According to a secret protocol attached to the Molotov–Ribbentrop Pact of 1939 (revealed only after Germany's defeat in 1945), Northern and Eastern Europe were divided into Nazi and Soviet spheres of influence. 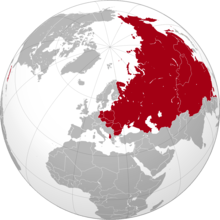 In the North, Finland, Estonia, and Latvia were assigned to the Soviet sphere. Poland was to be partitioned in the event of its "political rearrangement"—the areas east of the Narev, Vistula, and San Rivers going to the Soviet Union while Germany would occupy the west. Lithuania, adjacent to East Prussia, would be in the German sphere of influence, although a second secret protocol agreed in September 1939 assigned Lithuania to the USSR. Another clause of the treaty stipulated that Bessarabia, then part of Romania, would join the Moldovan ASSR and become the Moldovan SSR under the control of Moscow. The Soviet invasion of Bukovina on 28 June 1940 violated the Molotov-Ribbentrop Pact, as it went beyond the Soviet sphere of influence as agreed with the Axis. The USSR continued to deny the existence of the Pact's protocols until after the dissolution of the USSR when the Russian government fully acknowledged the existence and authenticity of the secret protocols. From 1941 and the German attack on the Soviet Union, the Allied Coalition operated on the unwritten assumption that the Western Powers and the Soviet Union had each its own sphere of influence. The presumption of the US-British and Soviet unrestricted rights in their respective spheres started causing difficulties as the Nazi-controlled territory shrank and the allied powers successively liberated other states. The wartime spheres lacked a practical definition and it had never been determined if a dominant allied power was entitled to unilateral decisions only in the area of military activity, or could also force its will regarding political, social and economic future of other states. This overly informal system backfired during the late stages of the war and afterwards, when it turned out that the Soviets and the Western Allies had very different ideas concerning the administration and future development of the liberated regions and of Germany itself. During the Cold War, the Baltic states, Central Europe, some countries in Eastern Europe, Cuba, Laos, Vietnam, North Korea, and, until the Sino-Soviet split and Tito-Stalin split, the People's Republic of China and the People's Federal Republic of Yugoslavia, among other countries at various times, were said to lie under the Soviet sphere of influence. Western Europe, Oceania, Japan, and South Korea, among other places, were often said to lie under the sphere of influence of the United States. However, the level of control exerted in these spheres varied and was not absolute. For instance, France and the United Kingdom were able to act independently to invade (with Israel) the Suez Canal (they were later forced to withdraw by joint U.S. and Soviet pressure). Later, France was also able to withdraw from the military arm of the North Atlantic Treaty Organisation (NATO). Cuba often took positions that put it at odds with its Soviet ally, including momentary alliances with the People's Republic of China, economic reorganizations, and providing support for insurgencies in Africa and the Americas without prior approval from the Soviet Union. With the end of the Cold War, the Eastern Bloc fell apart, effectively ending the Soviet sphere of influence. Then in 1991, the Soviet Union ceased to exist, replaced by the Russian Federation and several other ex-Soviet Republics who became independent states. After the fall of the Soviet Union, the countries of Eastern Europe, the Caucasus, and Central Asia that became independent were often portrayed as part of the Russian Federation's "sphere of influence". According to Ulrich Speck, writing for Carnegie Europe, "After the breakup of the Soviet Union, the West's focus was on Russia. Western nations implicitly treated the post-Soviet countries (besides the Baltic states) as Russia's sphere of influence." In 1997, NATO and Russia signed the Founding Act on Mutual Relations, Cooperation and Security, stating the "aim of creating in Europe a common space of security and stability, without dividing lines or spheres of influence limiting the sovereignty of any state." In 2009, Russia asserted that the European Union desires a sphere of influence and that the Eastern Partnership is "an attempt to extend" it. In March 2009, Sweden's foreign minister Carl Bildt stated that "The Eastern Partnership is not about spheres of influence. The difference is that these countries themselves opted to join". Following the 2008 Russo-Georgian War, Václav Havel and other former central and eastern European leaders signed an open letter stating that Russia had "violated the core principles of the Helsinki Final Act, the Charter of Paris... -all in the name of defending a sphere of influence on its borders." In April 2014, NATO stated that "Contrary to [the Founding Act], Russia now appears to be attempting to recreate a sphere of influence by seizing a part of Ukraine, maintaining large numbers of forces on its borders, and demanding, as Russian Foreign Minister Sergei Lavrov recently stated, that “Ukraine cannot be part of any bloc.”" Criticising Russia in November 2014, German Chancellor Angela Merkel said that "old thinking about spheres of influence, which runs roughshod over international law" put the "entire European peace order into question". In January 2017, British Prime Minister Theresa May said, "We should not jeopardise the freedoms that President Reagan and Mrs Thatcher brought to Eastern Europe by accepting President Putin's claim that it is now in his sphere of influence." In corporate terms, the sphere of influence of a business, organization or group can show its power and influence in the decisions of other businesses/organizations/groups. Influence shows in several ways, such as in size, frequency of visits, etc. In most cases, a company described as "bigger" has a larger sphere of influence. For example, the software company Microsoft has a large sphere of influence in the market of operating systems; any entity wishing to sell a software product may weigh up compatibility with Microsoft's products as part of a marketing plan. In another example, retailers wishing to make the most profits must ensure they open their stores in the correct location. This is also true for shopping centers that, to reap the most profits, must be able to attract customers to their vicinity. There is no defined scale measuring such spheres of influence. However, one can evaluate the spheres of influence of two shopping centers by seeing how far people are prepared to travel to each shopping center, how much time they spend in its vicinity, how often they visit, the order of goods available, etc. ^ Jeans, Roger B. (1997). Democracy and Socialism in Republican China: The Politics of Zhang Junmai (Carsun Chang), 1906-1941. Rowman & Littlefield. p. 28. ISBN 0847687074. ^ Paine, S. C. M. (1996). "Chinese Diplomacy in Disarray: The Treaty of Livadia". Imperial Rivals: China, Russia, and Their Disputed Frontier. M.E. Sharpe. p. 162. ISBN 9781563247248. Retrieved 22 February 2018. ^ Lo Jiu-Hwa, Upshur (2008). Encyclopedia of World History, Ackerman-Schroeder-Terry-Hwa Lo, 2008: Encyclopedia of World History Volume 7 of Encyclopedia of World History. Fact on File Publishing, Inc Bukupedia. pp. 87–88. ^ Speech and interview at the University of Michigan, 1902. ^ Shan, Patrick Fuliang (2003). The Development of the North Manchuria Frontier, 1900-1931. Hamilton, Ontario: McMaster University. p. 13. ^ Shan, Patrick Fuliang (2016). Taming China's Wilderness: Immigration, Settlement and the Shaping of the Heilongjiang Frontier, 1900-1931. Routledge. p. 154. ISBN 1317046846. ^ Patrick Fuliang Shan, “What was the ‘Sphere of Influence’? A Study of Chinese Resistance to the Russian Empire in North Manchuria, 1900-1917,” The Chinese Historical Review, (Fall 2006, vol. 13, no. 2), pp.271-291. ^ "Secretary of State John Hay and the Open Door in China, 1899–1900". Milestones: 1899–1913. Office of the Historian, US Department of State. Retrieved 17 January 2014. ^ Tuchman, Barbara (2001). Stillwell and the American Experience in China 1911-1945. Grove Press. p. 48. ISBN 0-8021-3852-7. ^ Werner Levi (1953). Modern China's Foreign Policy. U of Minnesota Press. pp. 123–132. ISBN 081665817X. ^ B. J. C. McKercher (1991). Anglo-American Relations in the 1920s: The Struggle for Supremacy. Springer. p. 166. ISBN 1349119199. ^ Declaration between the United Kingdom and France concerning Siam, Madagascar, and the New Hebrides . Governments of Great Britain and the French Republic. 1904 – via Wikisource. ^ "Monroe Doctrine, 1823". Office of the Historian. United States Department of State. April 6, 2016. Retrieved March 26, 2016. ^ Morison, S.E. (February 1924). "The Origins of the Monroe Doctrine". Economica. doi:10.2307/2547870. JSTOR 2547870. ^ New Encyclopædia Britannica. 8 (15th ed.). Encyclopædia Britannica. p. 269. ISBN 1-59339-292-3. ^ Gramer, Robbie. "Tillerson Praises Monroe Doctrine, Warns Latin America of 'Imperial' Chinese Ambitions". Foreign Policy. The Slate Group. ^ Etkind, Alexander; Finnin, Rory; Blacker, Uilleam; Julie Fedor; Simon Lewis; Maria Mälksoo; Matilda Mroz (2013). Remembering Katyn. John Wiley & Sons. ISBN 978-0-7456-6296-1. ^ Speck, Ulrich (9 December 2014). "The EU Must Prepare for a Cold Peace With Russia". Carnegie Europe. ^ "Founding Act on Mutual Relations, Cooperation and Security between NATO and the Russian Federation signed in Paris, France". NATO. 27 May 1997. ^ a b Pop, Valentina (21 March 2009). "EU expanding its 'sphere of influence,' Russia says". EUObserver. "An Open Letter". Radio Free Europe. ^ "Russia's accusations - setting the record straight, Fact Sheet - April 2014". NATO. 12 May 2014. ^ Rettman, Andrew (17 November 2014). "Merkel: Russia cannot veto EU expansion". EUobserver. ^ "FULL TEXT: Theresa May's speech to the Republican 'Congress of Tomorrow' conference". Business Insider. 26 January 2017. Archived from the original on 27 January 2017. Wikimedia Commons has media related to Spheres of influence. Russia - a counterbalancing agent to the Asia.